Venerable Master Hsing Yun (Simplified Chinese: 星云大师; Traditional Chinese: 星雲大師; Hanyu Pinyin: Xing Yun Da Shi, «star and cloud»; Vietnamese: Hòa Thượng Tinh Vân) (1927-) is an important figure in modern Mahayana Buddhism. He is well known around the world for his humanitarian work, calligraphy, his talent in speaking the Dharma, and his talent in writing. He is also an active philanthropist. 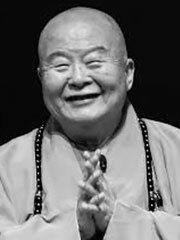 Master Hsing Yun is also a pioneer in pushing forth the ideal of Humanistic Buddhism. Master Hsing Yun is best known as the founder of the Fo Guang Shan Buddhist Order, the largest religious and humanitarian organization in Taiwan. He is also the 48th patriarch of the Rinzai Zen school. Master Hsing Yun was born 1927 in Jiangsu province in China in a family under the surname of Li. (李) His birth name was Li Kuo-shen. (李國深) He was the third of four children, with an older brother, an older sister, and a younger brother. His father left home to do business and was never heard from again. When his mother, who was a faithful Buddhist herself, was desperately searching for her husband, he went to Nanjing. By chance, he came across the host monastic as Chi-Hsia Shan Monastery. The host monastic asked young Li if he wanted to become a monastic, to which Li immediately blurted out «yes». In a half hour, Master Zhi Kai, the abbot of the monastery, requested that Li could be tonsured under him, therefore, Master Zhi Kai would be his master. Therefore at the age of 12, young Li was tonsured. He was ordained under the dharma names name Jin Chueh (今覺, to be enlightened today), and Wu Che (悟徹, through enlightenment). In 1941, Hsing Yun was fully ordained and went on to formal monastic training at Ch’i-Hsia Vinaya School and transferred to Chiao-Shan Buddhist College in 1945. From an early age, he vowed to revitalize and spread Buddhism. As mainland China was enmeshed in civil war, he left his home in 1949 to head for Taiwan. In 1979, after being separated for half of a century, he was reunited with his mother and would usually tend to her most of the time in her last years of her life. She died at Hsi Lai Temple in 1995 at the age of 90, a month after Hsing Yun’s heir apparent, Venerable Hsin Ping passed away. One day, when Jin Chueh was still a student at Chiao-Shan Buddhist College, he happened to stumble onto the word Hsing Yun, which means «star and cloud», in the dictionary. Jin Chueh admired the infiniteness and boundlessness of these nebulas and wished that he could shed light on darkness and be as free and unbound as clouds and stars. When Jin Chueh needed a new identification card after China’s victory over Japan, he gave himself the Dharma name of Hsing Yun. In 1949, Hsing Yun wrote his first book, «Singing in Silence», the first stepping stone in his writing career. In later years, he founded several Buddhist publications, and was promoted as editor-in-chief for many Buddhist periodicals and newsletters for various temples and wrote articles for major Taiwanese newsletters. In 1955, he published one of the first hardback biographies of Sakyamuni Buddha. When Hsing Yun was a writer for a local Taiwanese newsletters, magazines, and radio stattions, he was known as Mo Jia (摩迦), the Chinese name for Mahakasyapa, a senior disciple of the Buddha. He called himself this because he made a strenuous effort in promoting the Dharma and writing. Some time later, he called himself Jiao Fu (腳夫), meaning porter. He called himself this because he served people, carried loads and labored. Jiao Fu was also the pen name for a novel Hsing Yun wrote called «National Master Yulin» (玉琳國師), which was later turned into a television soap opera, Continued Fate of Love. He chose Jiao Fu because he wasn’t sure if a romantic novel would be accepted by the public if it was written by a Buddhist monk. Starting in the 1950s, Hsing Yun started making many achievements at an early age. He taught numerous classes, built many schools for children, recorded the first Buddhist hymns, and was promoted as an executive in many Buddhist associations. In 1957, Hsing Yun established a Buddhist cultural center in which a variety of Buddhist books are published with training tools such as audio and visual aids. In 1959, Hsing Yun also supported the Tibetan movement against communist supression, and organized the first float parade in celebration of Wesak in Taiwan. Perhaps one of Hsing Yun’s greatest achievements was his successful push for Wesak to become a national holiday in Taiwan, a wish that had been granted by former ROC President Lee Teng-hui in 2000. In 1997, Hsing Yun was invited to a Cross-century Religious Dialogue with the late Pope John Paul II. Under the invitation of the Roman Catholic Church at the Vatican, Hsing Yun met with the Pope for an inter-religious dialogue to promote inter-religious exchange between the two parties and to pray for world peace. This was a great progressive step for Buddhism in Taiwan toward international exchange. So far, the Fo Guang Shan Buddhist Order have not made plans to meet with the current Pope, Pope Benedict XVI. In 1967, Master Hsing Yun made plans to build a large Buddhist monastery in the mountains. During that time that was spent clearing the moiuntains, the endless toiling away, wave upon wave of physical strain, the planning that carried on into all hours of the day, the barrage of floods and other natural disasters, and the belligerant mobs that surrounded the mountain were all quite beyond description. Soon after the building of Fo Guang Shan, many countries, including most parts of Taiwan, each had their own Fo Guang Shan branch temple. Hsi Lai Temple (USA), Nan Tien Temple (Australia), and Nan Hua Temple (South Africa) are among the biggest branch temples. Fo Guang Shan branch temples can be found in the United States, Canada, Brazil, Japan, Hong Kong, Thailand, Malaysia, Australia, France, the Netherlands, South Africa and the United Kingdom. Master Hsing Yun was the abbot of Fo Guang Shan for the first three terms. From 1967, after Master Hsing Yun’s founding of Fo Guang Shan, he worked relentlessly to promote Humanistic Buddhism. However, in an effort to systematize and modernize Buddhism, Master Hsing Yun shocked his disciples by announcing his abdication on September 22nd, 1985 without any regret or hesitation. He handed not only the abbotship, but also gave dharma transmission to his most senior disciple, the most Venerable Hsin Ping. At the time of the Venerable Master’s announcement, every devotee was shocked by the news and could not bring themselves to accept the decision. The abdication of Master Hsing Yun was done for the sake of setting a fine example for the democratization of Buddhism. From a social point of view, Master Hsing Yun’s action served to educate and enlighten the minds of the people and for Fo Guang Shan, it was a day of historical importance. More than 1,000 monastic disciples have been tonsured under Master Hsing Yun, with over a million followers. During his life’s work, he has promoted the ideals of Humanistic Buddhism and being «a global person». His philosophy calls for a life in which the spirits of joy and harmony, integration and coexistence, respect and magnanimity, equality and peace are widely disseminated. In Taiwan and the United States, many detractors call Master Hsing Yun a political monk, most likely because of his involvement with politics, especially his promotion of the democratization of Buddhism. He also had used democratic ideals to help govern Fo Guang Shan monastery, which is an oddity for a traditional Buddhist monastery. Master Hsing Yun set a paradigm of democracy in the Fo Guang Shan Buddhist Order by vowing to abide by the Buddhist regulations, passing down the tradition, systematic management, and guiding through an organizational structure. Critics, however, have suggested that Master Hsing Yun’s democratic ideals have strayed him far afield from the traditional monastic concerns. In 1996, Master Hsing Yun’s main Fo Guang Shan branch temple in the United States, Hsi Lai Temple, became embroiled in a high-profile controversy involving the 1996 presidential campaign, when nuns there held a fund-raiser for Vice President Al Gore. For more information see Chinagate.